This article first appeared on East Niagara Post on April 28, 2015. It is repeated here as I work to put all my book reviews in one place. They will be posted on Thursdays or Fridays and only be altered from the original in that I will add publisher information and pages. Hopefully, by revisiting these reviews, other people might find a book they'd like to pick up for their own enjoyment. Conspiracy theorists will love the book that is being reviewed this week. This book is full of some riveting conspiracies. What if the government could take you off the morning train and make you disappear completely, without warning or warrant? What if these governmental officials were a bit overzealous in their interpretation of the Patriot Act? What if what you thought was reality was simply a carefully orchestrated fantasy? 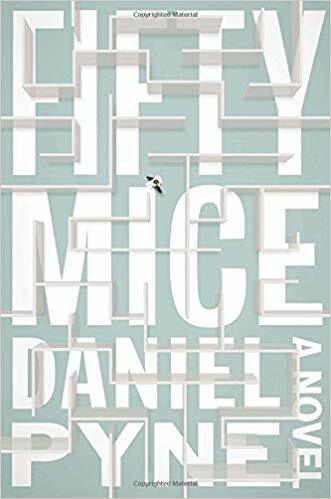 All these questions and more will bring you to the edge of your seat as you read Fifty Mice by Daniel Pyne. The story starts with Jay Johnson boarding the commuter train as he heads off to work. While assisting a seemingly helpless elderly woman, he finds himself trapped on the train with his own bags still on the platform and people who seem to be following his every move just a bit too closely. He feels a prick, and then falls into darkness. After this first, quick-paced chapter, we move back in time several days. Jay is visiting his friend, Vaughn, at his place of employment. Vaughn works in a laboratory where he studies mice as they work their way through a maze. Different rewards or punishments deliver different results as each mouse learns the expectations. The fifty mice almost seem like a feint in the rest of the novel, but there is much more to the symbolism of the mice. It speaks of experiments meant to implant false memories in mice. This is what seems to happening with our protagonist. Once we make our way through the aside with Vaughn, Jay wakes up in a place that he does not recognize, handcuffed to a hospital bed “for his own safety.” It is explained that he was not kidnapped. He was just forcibly taken into protective custody over something the government believes he may have seen. His guards assure him he is a guest, not a prisoner. Jay is taken to Catalina Island where he will live in witness protection until his handlers deem it safe. Meanwhile, back in the world Jay left behind, his history is irrevocably changed. His former fiance, Stacy, is told Jay has been sent permanently to an asylum. His best friend is told the same thing, but is also instructed on how to react when Jay shows up at his laboratory. Back on Catalina Island, Jay is renamed Jimmy, although he insists on Jay. He is put up in a house with a woman, Ginger, and her mute daughter, Helen. The fiction being passed off is that they are a family living on the island in relative serenity. However, there is something mysterious about the family he has acquired and the town that seems to be more governmental officials and other protected citizens than normal residents. And they all want to know what he’s seen, even if he has no clue as to what they’re talking about. This is where the book gets a little tedious. Jay spends a lot of his time trying to figure out what is real and what his handlers want him to think is real. The rest of his time is trying to escape from the island. There is not a lot of action in this part of the narrative as Jay formulates his plans. The action in this story slows as Jay tries to make it appear he is finally accepting his predicament. It is during this time he makes a breakthrough with his “daughter,” Helen. Jay finally makes his escape and returns to his home to meet up with Stacy. He finds her having moved on with her life after his disappearance, though her new boyfriend may not be all that he seems to be. Jay continues to question his reality. Later, when he convinces Vaughn to meet with him, only to have his best friend apparently kidnapped, Jay determines that there is more going on with his incarceration. Jay returns to Catalina Island to find his home empty. Ginger and Helen are gone. He realizes that he misses their company despite the idea of having his own family was not a high priority of his. He demands their return, stating he will tell his captors nothing until the girls are back home with him. It is at this point the action really picks up in the narrative. Jay convinces Ginger and Helen to escape from the island with him. He feels at this point that they are his family. Faced with mad men from both the government and others, Jay finally learns the truth as to what information they were expecting him to divulge. After a dramatic, adrenaline-filled showdown with his captors Jay understands what he has been held for, and understands what he wants with his life. The time he spent in protective custody has changed his perspective on life. The most intriguing aspect of this book is how often the perception of what is real has to be questioned. While Jay is confused about his surroundings, the reader is drawn into the narrative as he or she attempts to separate fact from fiction. Daniel Pyne, a screenwriter, writes like he is setting the stage for television or screen. For the most part in this novel, it works well. In other places, his career as a screenwriter plainly shows through the thinness of the plot. Visually, your actors and actresses can fill in what the screenwriter has missed with their expressions, body language and ad-libs. When it’s committed to the page, that safety net is missing. There were a few places where that shortcoming is readily noticed. Overall, Fifty Mice by Daniel Pyne is a well-written thriller that will keep you engaged for the most part. There is a lengthy section in the middle of the book the reader must muddle through, but it does help set the stage for action at the end of the book. Daniel Pyne will take you on a thrill ride that delivers great action to begin the story, and greater action to finish it. Pyne uses language that is easy to follow and does not fall into endless cliche. His characters, especially the confusion of Jay, reverberate with authenticity. Ginger, the most mysterious of his characters, holds back on exposing who she really is, not only in action, but also in the way he delivers her dialogue. Her words are stunted and terse, rendering Jay and the reader ignorant to her real intentions. Some of Daniel Pyne’s accomplishments include the remake of The Manchurian Candidate, Pacific Heights, and Fracture. He has a large list of television credits and has previously published two other novels, Twenty-Nine Palms and A Hole in the Ground Owned By a Liar. Despite the lull in the center of the tale, I thoroughly enjoyed this book and look forward to reading other works by him. I’m hoping that as he continues to write novels, he hones his craft to write even greater novels. Craig Bacon once had a dream that seemed so real that he was actually frightened when the real alarm woke him from his slumber.